You Have Been Watching…I Know Where I’m Going | Scots Whay Hae! Michael Powell and Emeric Pressburger made some of the greatest films of all time such as The Red Shoes, A Matter of Life and Death and Black Narcissus. They were known for marrying often heartbreaking stories with ground-breaking visual flourishes which stay with audiences long after they have finished viewing. 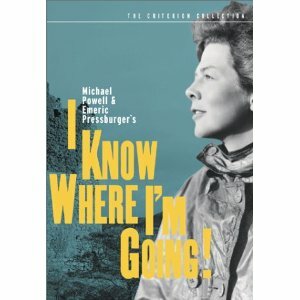 I Know Where I’m Going is not one of their better known, but it is one of the most subtle and successful. It may not get you immediately, but you’ll want to watch it again and again. It’s the story of independent woman Joan Webster, who ‘knows where she is going’ in life. Determined to marry rich and old, she travels to the island of Kiloran to wed the industrialist Sir Robert Bellinger who has a house there. Do things go awry? Of course they do, and Joan finds herself stranded on the Isle of Mull with a cast of eccentric locals as company. Although the supporting cast are great, particularly Pamela Brown’s hooray Henrietta ‘Catriona Potts’ and C.W.R Wright’s ornithological oddbod ‘Colonel Barnstable’, the film is all about the love/hate relationship between Wendy Hiller’s ‘JoanWebster’ and the great Roger Livesay’s ‘Torquil MacNeil’. Their relationship is similar to Spencer Tracey and Katherine Hepburn in Adam’s Rib or Cary Grant and Rosalind Russell in His Girl Friday. These are two headstrong characters who clash constantly despite the obvious attraction. Livesay in particular is having the time of his life, almost winking to the camera as he winds up the often infuriating Joan. Things do become a little predictable towards the end, but by that time, unless you have a heart of stone, you want it to be predictable. Having said that I’ve often thought that Catriona would be a better match for Torquil. As you can see from the above clip the film is beautifully shot, as you would expect from P&P. The camera captures the drama of the Hebrides and there are some scenes that are rightly held up as classic. The ‘Colonel’s phonecall’ which takes place under a waterfall, the boat ride through the Corryvreckan whirlpool, the local ceilidh, and the scenes in the Castle of Moy are just a few examples, and you have to keep you’re eyes peeled to spot many of the visual gags and flourishes. Over the years this has come to be one of my favourite Scottish films, partly because it is slightly magical in a way that few films are. Even if you’re not a fan of Powell and Pressburger (although I can’t imagine why that would be) this is still worth viewing. It’ll warm those cockles that you forgot you had.